Tribune News Service With kids in the house, you can expect some messes. Instead of getting upset, stay calm and attack the stains. So when she recently found her 2-year-old daughter, Eloise, pouring a bottle of green nail polish onto a cream-colored rug, she did not yell or scream, but rather did what most people do: She frantically channeled her energy into rubbing it with stain remover. When the stain did not come out, she just flipped the rug around, hiding the damaged portion under her daughter's bunk bed. “I am terrible in these situations because even though I know what I am doing is wrong, I do it anyway,” she said. Riley advises that you should narrate back to your child what you see – “I see there's purple slime on the carpet” – then explain that slime sticks to everything, so it should be used only in the kitchen or outside. Then involve your child in the cleanup. “Let them experience some of the pain and hardship that comes with cleaning; it will help them remember not to do it again,” Riley says. As a longtime magazine editor and mother of two, I've learned a lot about cleaning over the years. Here are some of my best solutions for clothes, fabrics, walls and carpets – the spots where kids tend to make the biggest messes. • Stains should be treated as soon as possible; that doesn't mean you should follow your kid around with a Clorox pen, but the sooner you pre-treat a stain with a stain remover such as Shout or OxiClean, the better chance you have of removing it. • Always wash a stained item in the hottest water that the fabric will allow (with the exception of protein-based stains – see below). Hot water will help to loosen and remove dirt. • Check to see whether a stain has disappeared before you put it in the dryer; dry heat will “bake” the stain into the fibers. If you have a stubborn stain that doesn't come out after one wash, treat it again with a stain remover and rewash. • When using harsh chemicals such as nail polish remover or hair spray to remove a stain, make sure you try it on a hidden area first; it may damage the color of the fibers. Protein-based stains: Formula, milk, diaper accidents, blood – all of these are protein-based stains, so the first thing you want to do is soak the item in cold water about 20 minutes to loosen the stain. Remove the item from the water and treat the stain with a dab of an enzyme-based detergent such as Biz, Era Plus, Wisk or Axion and let it sit 30 minutes. If the stain persists, dab it with some diluted white vinegar or diluted ammonia to lighten the stain. Machine wash.
Urine: For clothing, rinse the item in cold water, then wash in a normal cycle. For mattresses, first blot the area with towels. In a spray bottle, combine one part white vinegar to two parts water. Spray the mixture over the affected area, then blot with towels. Cover the area in baking soda and let it sit for 8 to 10 hours. Vacuum the baking soda, then allow it to dry completely. 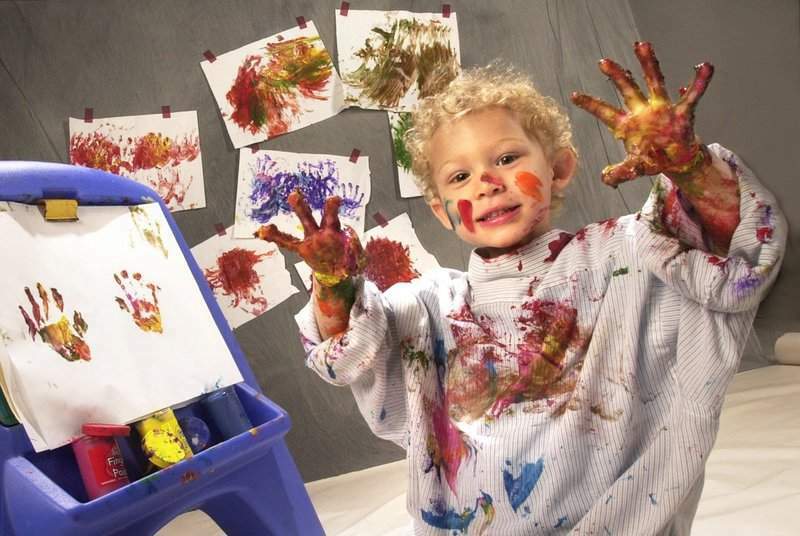 Crayon: For stains on clothing, place the item stain-side down on a clean white cloth or stack of paper towels. Spray with WD-40 or Goo Gone and let sit several minutes. Turn the item over and apply WD-40 to the other side of the stain and let set several more minutes. Dab the stain on both sides with some dishwashing detergent and wash in hot water. Remove crayon marks from painted or wallpapered walls with a dry cleaning sponge or a Mr. Clean Magic Eraser. Acrylic or water-based paint: Dab off as much as you can with a paper towel. Sponge on a solution of liquid laundry detergent and warm water to soften the paint. Scrape off as much of the paint as you can with a dull knife. Rinse and repeat. If the stain persists, apply a small amount of hair spray, rubbing alcohol or nail polish remover to the spot and allow it to sit 15 minutes. Blot with clean dry cloths. Repeat until the stain is gone. For clothing, machine wash. For carpets, run a steam vacuum over the spot or flush the spot with cold water and blot until most of the moisture is removed. Chalk: Shake the item outside to remove as much of the chalk as possible. Lay the clothing on a clean white towel and blot the spot with rubbing alcohol. Rinse thoroughly. Dab the spot with liquid laundry detergent. Machine wash.
Play-Doh: Do not use hot water or cleaning solutions of any kind. Allow Play-Doh to dry completely, loosen it with a stiff brush, then vacuum up the pieces. Slime: Remove as much as you can with your hands. Mix two parts white vinegar with one part water in a spray bottle. Spray the mixture on the slime and allow it to soak, then blot the area with paper towels or a clean white cloth. Keep spraying and blotting until the slime is gone. Nail polish: Use paper towel or a clean towel to dab up as much of the wet nail polish as possible. Once you've absorbed the excess, spray a small amount of non-acetone nail polish remover on the stain. Dab the area with clean paper towels until the stain is lifted. Rinse with cold water and mild soap.